As parents we're constantly battling and on many fronts losing this grotesque war against the Chemical Industry who sees nothing wrong with manufacturing products that are known to be horrible for us and the Environment. Many cleaning products as well as personal hygiene products contain cancer causing carcinogens and/or toxins that cause a variety of abnormalities. They're lurking in everyday things..Shampoo, Deodorant, Household Cleaners. Most of the time we think as long as the product isn't being ingested then all is safe but the sick truth is our skin and respiratory tract are taking most of it in without us even really paying much notice. And whats worse is that our kids are being subjected to heavier concentrations of these toxins because simply they're smaller than we are and not fully developed. Having a clean home and smelling okay shouldn't kill you in the long run. It's just not a fair trade. So why not get back to the basics? There was a time before everything just had to smell lemony fresh that clean was clean. If you've ever seen a big ol' box of baking soda at your Granny's house then you just might know what I'm talking about. I use it to bake with and clean with.. It's so all around, I've come to depend on it. What makes it just the ultimate of all ultimates is how safe it is. 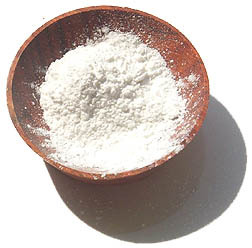 Baking Soda has been around for a while, garnering it much credibility. It has roots all the way back to Ancient Egypt. Whats more is that it is naturally derived. There are no hidden or hard to pronounce ingredients. In it's most simplest explanation it's aerated salt. It is so versatile the list of ways to use it could stretch out very long but here are a few uses for Baking Soda I choose all of the time. 1. It makes a beautifully mild face and body scrub. Not too abrasive at all and whatever the skin type, it does what it was born to do....neutralize! You'll walk away with your skin feeling all kinds of clean without the residue left behind by synthetic ingredients. 2. Jewelry Cleaner. I put 1 to 2 tablespoons of baking soda in a mason jar containing 4 oz. of water, stir and put my bracelets in and let them sit for a few. Whatever bit of tarnish or dullness there was, is now no more. 3. Pot and Pan Scrub. Yep, when I'm standing over the sink working on the pot that stayed on the stove a little too long or the pan that wasn't oiled enough I get out the baking soda. Baking Soda and elbow grease combined will get your cookware back in tip top shape! 4. Toothpaste and Mouthwash. As a gentle abrasive it scrubs away plaque and neutralizes the bacteria that hangs out on your tongue and gums. If fluoride already freaks you out, this makes an excellent alternative. 5. Laundry Detergent booster. I add a 1/2 cup of baking soda along with the recommended amount of detergent according to my settings. It boosts the cleaning power and aids in neutralizing the bacteria that causes the odors. So there you have it. 5 Simple to implement uses for Baking Soda that I hope you give a try. In many cases Baking Soda will clean 10 times better than many commercial products but most importantly you will be reducing the amount of toxins you bring in to your home. It's a hard battle but well worth it. Taking the sting out of a bug bite when mixed into a paste.